BDS Suspension adds to its lineup of heavy duty upper control arms (UCA) with new kits available for the new 2019 Ford Ranger trucks. These new UCAs are designed for improved strength, great looks, and increased suspension droop travel. They are built from high strength 1.5" OD x .120-wall tubing, fully welded for strength and durability. They use an indexed ball joint cup to correct the ball joint positioning for when used with leveling or full lift kits. The frame mounting ends feature durometer-specific rubber bushings for long laster durability and reduced NVHs. At the other end they utilize an indexed ball joint cup with premium quality MOOG ball joints for smooth, quiet operation and superior corrosion resistance to arms that feature uniballs, poly bushings or heims. 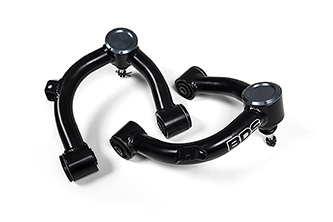 These control arms come finished in a durable semi-gloss black powder coat and include a billet aluminum machined ball joint dust cap that can be removed to easily service the greasable ball joints. They integrate a mounting tab for the factory ABS lines so there's no need to zip tie the lines as is the case with other kits on the market. The control arms come fully assembled for easy install right out of the box compatible with most leveling and lift kits on the market to increase wheel travel.